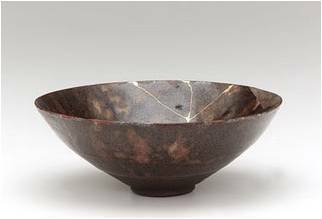 The story of kintsugi began in the late 15th century, when the shogun Ashikaga Yoshimasa sent a damaged Chinese tea bowl back to China to be fixed. It returned held together with ugly metal staples, launching Japanese craftsmen on a quest for a new form of repair that could make a broken piece look as good as new, or better. Japanese collectors developed such a taste for kintsugi that some were accused of deliberately breaking prized ceramics, just to have them mended in gold. Even today these ‘damaged’ pots can command higher prices than their ‘perfect ‘ counterparts. I love everything about the art of Kintsugi. The veneration of a piece for its history to the extent that some of these objects are repeatedly mended (you can see variations in the gold) so even when they had already been repaired they were valued enough to be repaired again. 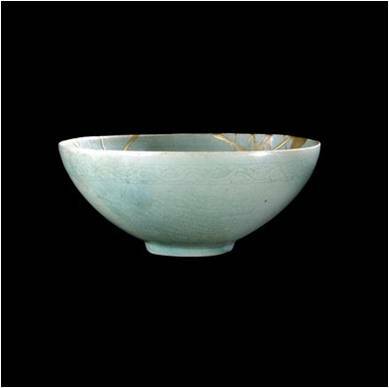 The fact that the repair actually adds to the piece making it even more beautiful, a gifted craftsmen looks at the whole object and adapts the process to not just blend with the bowl but to improve the design, sometimes working with it sometimes contrasting to add another dimension.